"Circular error" redirects here. For the circular error of a pendulum, see pendulum and pendulum (mathematics). CEP concept and hit probability. 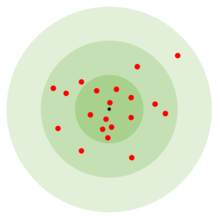 0.2% outside the outmost circle. There are associated concepts, such as the DRMS (distance root mean square), which is the square root of the average squared distance error, and R95, which is the radius of the circle where 95% of the values would fall in. The concept of CEP also plays a role when measuring the accuracy of a position obtained by a navigation system, such as GPS or older systems such as LORAN and Loran-C. The original concept of CEP was based on a circular bivariate normal distribution (CBN) with CEP as a parameter of the CBN just as μ and σ are parameters of the normal distribution. Munitions with this distribution behavior tend to cluster around the mean impact point, with most reasonably close, progressively fewer and fewer further away, and very few at long distance. That is, if CEP is n metres, 50% of rounds land within n metres of the mean impact, 43.7% between n and 2n, and 6.1% between 2n and 3n metres, and the proportion of rounds that land farther than three times the CEP from the mean is only 0.2%. CEP is not a good measure of accuracy when this distribution behavior is not met. Precision-guided munitions generally have more "close misses" and so are not normally distributed. Munitions may also have larger standard deviation of range errors than the standard deviation of azimuth (deflection) errors, resulting in an elliptical confidence region. Munition samples may not be exactly on target, that is, the mean vector will not be (0,0). This is referred to as bias. To incorporate accuracy into the CEP concept in these conditions, CEP can be defined as the square root of the mean square error (MSE). The MSE will be the sum of the variance of the range error plus the variance of the azimuth error plus the covariance of the range error with the azimuth error plus the square of the bias. Thus the MSE results from pooling all these sources of error, geometrically corresponding to radius of a circle within which 50% of rounds will land. Several methods have been introduced to estimate CEP from shot data. Included in these methods are the plug-in approach of Blischke and Halpin (1966), the Bayesian approach of Spall and Maryak (1992), and the maximum likelihood approach of Winkler and Bickert (2012). The Spall and Maryak approach applies when the shot data represent a mixture of different projectile characteristics (e.g., shots from multiple munitions types or from multiple locations directed at one target). 1.73 = 2.16 m R95 radius. Warning: often, sensor datasheets or other publications state "RMS" values which in general, but not always, stand for "DRMS" values. Also, be wary of habits coming from properties of a 1D normal distribution, such as the 68-95-99.7 rule, in essence trying to say that "R95 = 2DRMS". As shown above, these properties simply do not translate to the distance errors. Finally, mind that these values are obtained for a theoretical distribution; while generally being true for real data, these may be affected by other effects, which the model does not represent. The term is used in the movie Clear and Present Danger when the ground team reports "Circular error probability Zero. Impact with high order detonation. Have a nice day." Here CEP is meant to convey that the bomb landed exactly on target. ^ Nelson, William (1988). "Use of Circular Error Probability in Target Detection" (PDF). Bedford, MA: The MITRE Corporation; United States Air Force. ^ Ehrlich, Robert (1985). Waging Nuclear Peace: The Technology and Politics of Nuclear Weapons. Albany, NY: State University of New York Press. p. 63. ^ Payne, Craig, ed. (2006). Principles of Naval Weapon Systems. Annapolis, MD: Naval Institute Press. p. 342. MacKenzie, Donald A. (1990). Inventing Accuracy: A Historical Sociology of Nuclear Missile Guidance. Cambridge, Massachusetts: MIT Press. ISBN 978-0-262-13258-9.